If you are having problems logging in, please email the Webmaster. 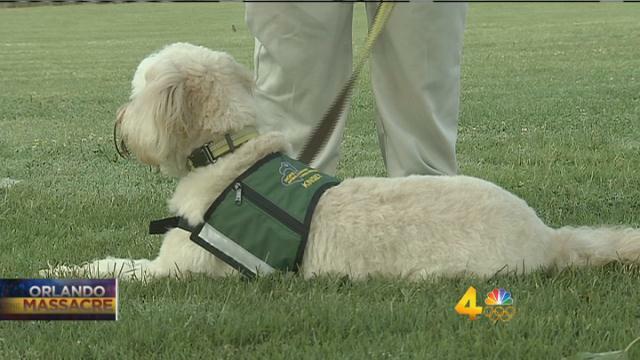 Specially trained dogs are providing comfort to those affected by the Burlington tragedy. HOPE AACR teams have been called out to support those affected by the Burlington, WA shooting. Certified HOPE dogs Chester, Bungee and Areya are featured in this King 5 News video bringing some smiles. Comments Off on Specially trained dogs are providing comfort to those affected by the Burlington tragedy. AKC Family Dog magazine featured the working dogs of 9/11 in an article this month, to include HOPE dogs. The notion that dogs have the power to ease human emotional suffering is not new. Anyone who’s cried in the presence of a canine companion knows that. Smoky, a 4-pound Yorkshire Terrier, is credited with being the first therapy dog, cheering wounded soldiers in hospitals on the islands around New Guinea during World War II. 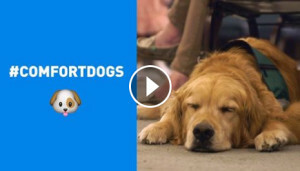 Dog trainer Cindy Ehlers first recognized the power of therapy dogs after the May 21, 1998, Thurston High School shooting, in Springfield, Oregon. She accompanied one of the first therapy dogs to work with the Red Cross in a disaster and one of the first to be certified for crisis-response. After that experience, Ehlers got a puppy, Tikva, a Keeshond, and trained her for crisis-response work. 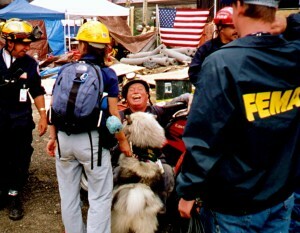 She also started an organization that is today the HOPE Animal-Assisted Crisis Response, in Eugene, Oregon. way beyond what is required of a therapy dog who visits hospitals and nursing homes. Ehlers says she saw some become too stressed to work. 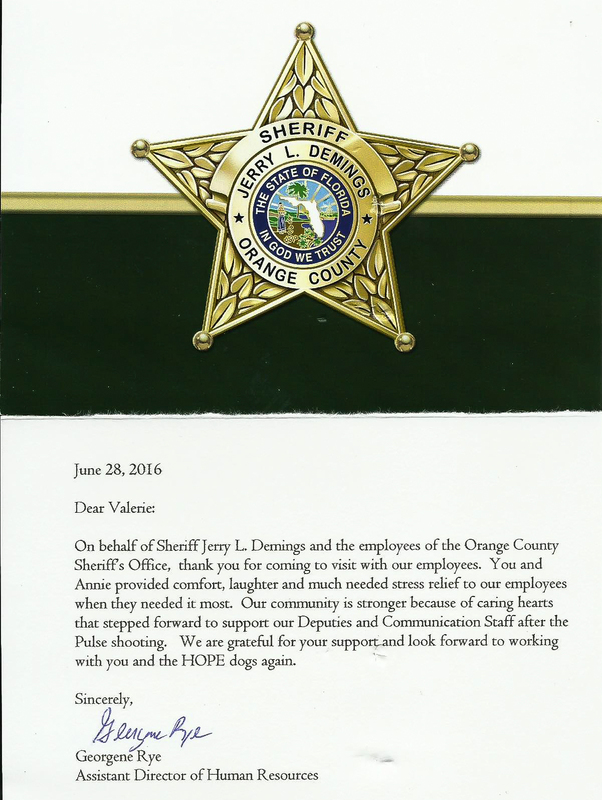 HOPE received a wonderful Thank You letter from the Orange County Sheriff’s office for their support for the people of Orlando. While we volunteer to bring comfort and smiles, these notes do so much to bolster all hard working volunteers! As the Orlando community tries to heal after the massacre nearly two weeks ago, some support is coming their way in an unexpected form from Tennessee. Crisis response canines are specially trained dogs that have the skills to interact with strangers at the worst times of their lives. There’s a new volunteer team in Middle Tennessee ready to comfort in emergencies as severe as Orlando. Kinsey and Alexis work with their handlers as part of a volunteer team with HOPE Animal-Assisted Crisis Response, and they are the first team in Middle Tennessee. Just like with FEMA’s Urban Search and Rescue dogs, comfort dogs can be a variety of breeds. The individual dog and its temperament is what really matters. You see lots of Labs and golden retrievers, but HOPE Animal-Assisted Crisis Response has a whole spectrum of dogs: from Newfoundlands to Shihtzus and from mixed breeds to show dogs. 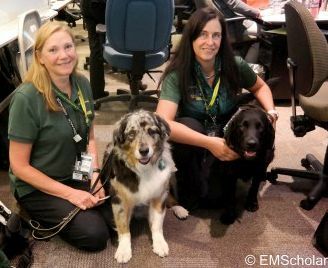 Teams spring into action after both manmade and natural disasters and FEMA works through HOPE Animal-Assisted Crisis Response to activate them. HOPE Animal-Assisted Crisis Response is a member of the National Voluntary Agencies Active in Disaster, a network of over 50 organizations committed to supporting individuals and communities impacted by disaster events. Their dogs helped us respond to the Oso mudslide in Washington state in 2014 as well as last fall’s historic flooding across South Carolina. 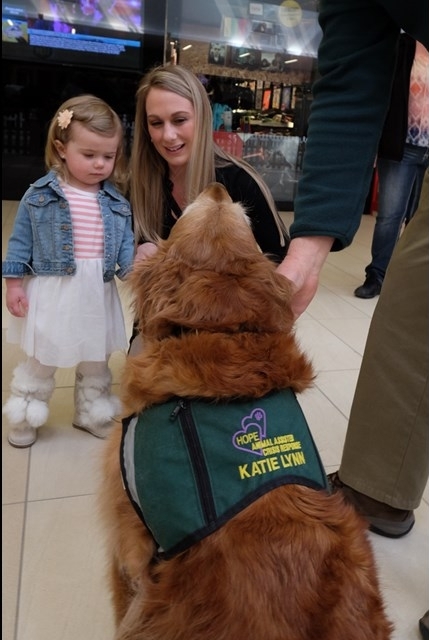 If there is a terrorist attack or other tragedy in North America, Katie-Lynn may be one of the dogs called in to help with the healing process. At the end of October, representatives from many of the voluntary agencies and non-profit organizations we work with came together for the first event of this kind in Washington, DC. 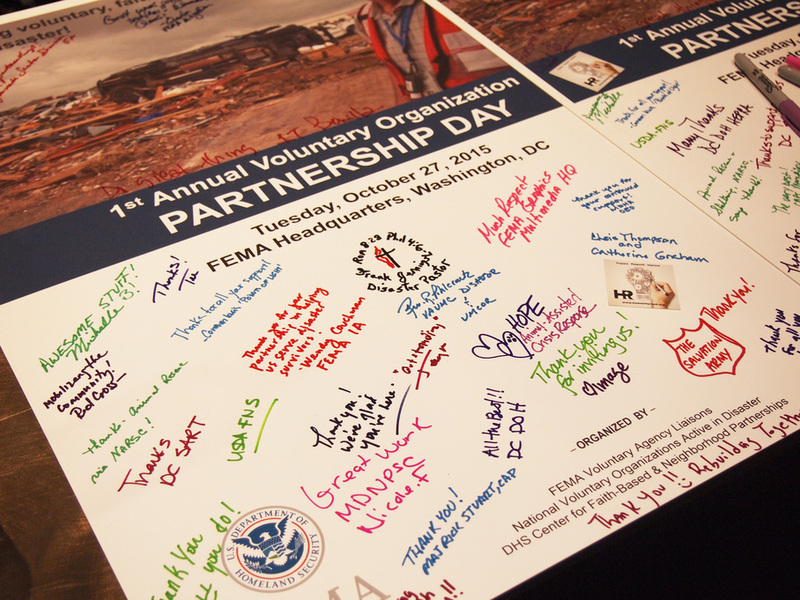 The event was designed to build, solidify, and highlight many of the connections that make disaster response and recovery successful. In the wake of this tragedy (the death of a high school football player), LaSalle High School wanted to do whatever they could for students.